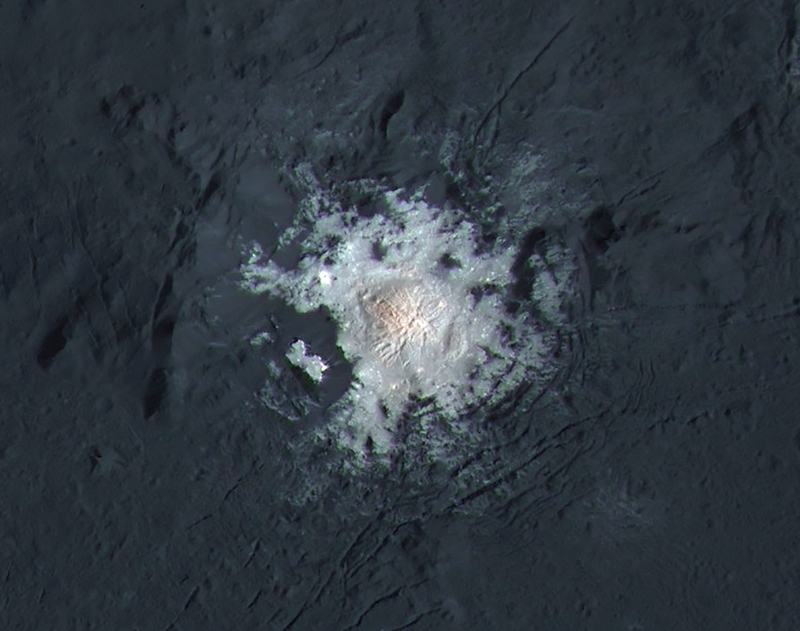 High-resolution, expanded-color view of the bright spot in Ceres’ Occator crater. Image credit: NASA/JPL-Caltech/UCLA/MPS/DLR/IDA/PSI. 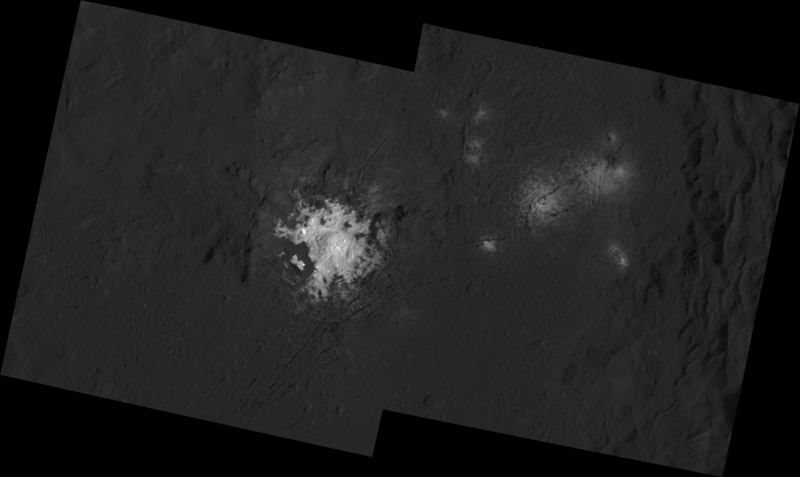 After more than a dozen years of head-scratching we finally have our first really good look at the weird bright spot on Ceres, thanks to NASA’s Dawn spacecraft and its low-altitude mapping orbit (aka LAMO) around the dwarf planet. Appearing from 240 miles up as a dome covered in cracks and rising from the surrounding darker terrain, the largest of Ceres’ bright spots looks not unlike… a giant pimple. The image above is an expanded-color view of the bright spot, made from new high-resolution data obtained in Feb. 2016 combined with color data from Sept. 2015. The color extends into the infrared, which is a wavelength our eyes can’t see, but it still gives a good idea of the variations in the surface areas. Data suggest that the bright area is composed of an inorganic form of salt, which is highly reflective as well as volatile, but the process that would create it is still not known. Based purely on this image, though, it looks to be erupting—again, like a pimple (or perhaps a piece of popcorn)—from below the surface of the crater floor. Ceres’ Occator crater measures 57 miles (92 km) across—about as wide as Lake Erie. This new image and many other findings on Ceres from Dawn were presented at the 47th annual Lunar and Planetary Science Conference in The Woodlands, Texas, on March 22, 2016. Read more in the latest NASA news release here, and watch the video below highlighting discoveries made by the Dawn mission. 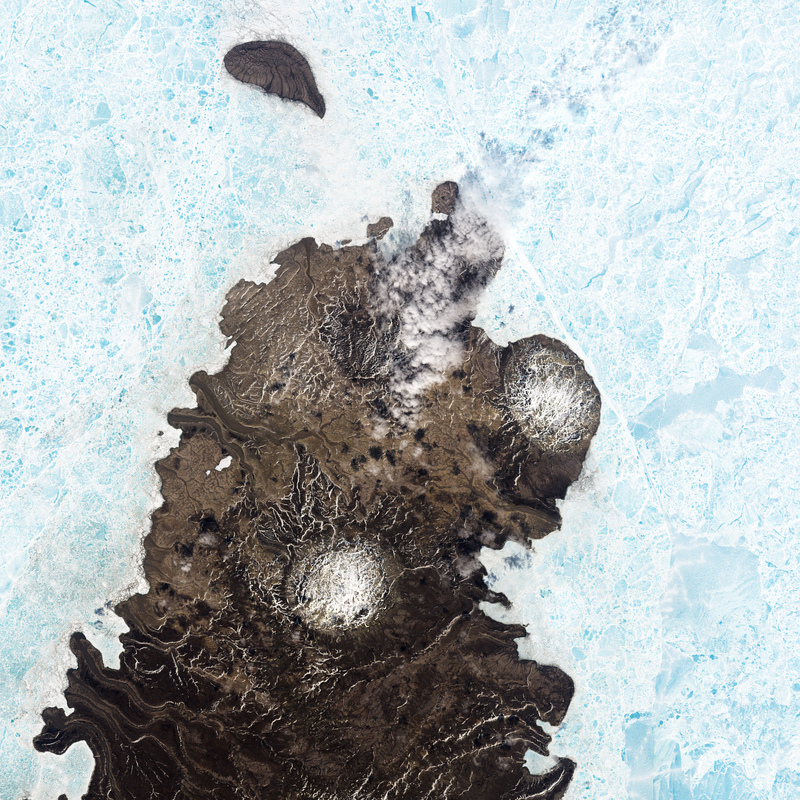 The nature of the bright spots has spurred a great deal of speculation over the past year or so, with most scientists positing that they’re composed of water ice or some type of salt.